In Heroes and Legends of Fin-de-Siecle France Venita Datta examines representations of fictional and real heroes in the boulevard theater and mass press during the fin de siecle (1880-1914), illuminating the role of gender in the construction of national identity during this formative period of French history. The popularity of the heroic cult at this time was in part the result of defeat in the Franco-Prussian War in 1870, as well as a reaction to changing gender roles and collective guilt about the egoism and selfishness of modern consumer culture. 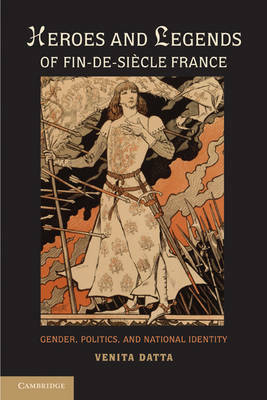 The author analyzes representations of historical figures in the theater, focusing on Cyrano de Bergerac, Napoleon and Joan of Arc, and examines the press coverage of heroes and anti-heroes in the Bazar de la Charite fire of 1897 and the Ullmo spy case of 1907.